Thinking about what to use used tea bags for? You won't ever throw away old tea bags after reading this. Here are 20 creative ideas for you. A large number of people drink tea daily and dump away the tea bags without recycling. 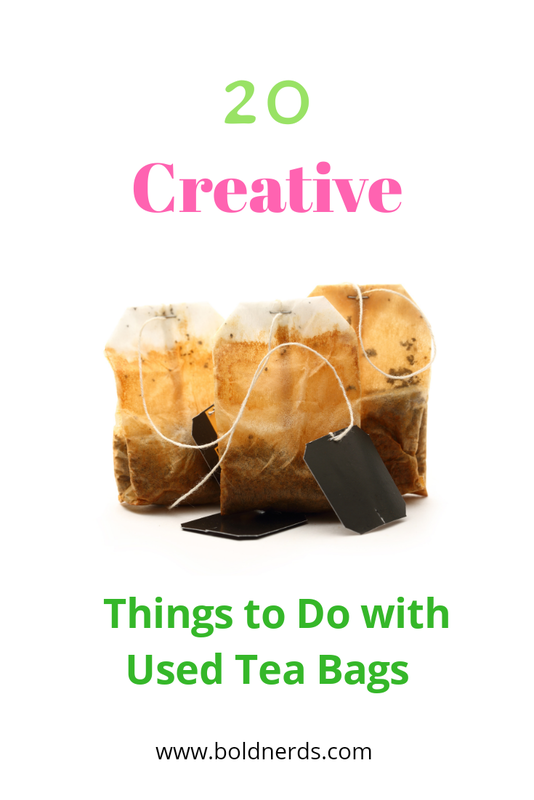 Have you ever thought about what you can use an old or used tea bags for? I can say for a fact that 80% of people who use tea bags daily dispose them after use. There's more to do with used tea bags and after reading this, you'll store your used tea bags for later. They'll no longer be a one-time-use product! Open up used tea bags and sprinkle the damp leaves around the base of your plants to fertilize the soil. You can also place used tea bags in a bowl of water and use the solution to water your plants and protect them from fungal infections. Tea bags also help to absorb odor which will leave your shoes, fridges, drawers and room fresh all day long even when the odour is very strong.. Just place a dry, used tea bag anywhere possible and at places which have unpleasant smell. We all want to have beautiful, long, soft and shiny natural hair. All you have to do is store your used tea bags for a hair treat. Use your old tea bags to condition your hair by just putting them into a bowl of warm water. Use the resulting solution to wash your hair after you shampoo. Place used tea bags in warm water, soak your feet to neutralize foot odors, soften calluses, and nourish your skin leaving your feet fresh. 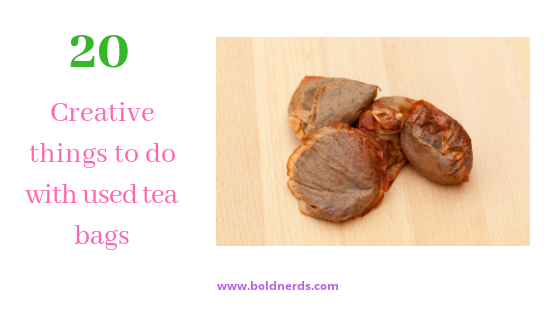 Open used tea bags and spread the leaves on a clean surface so they can dry up a little but make sure they don't dry up completely. Now, spread the semi dried leaves on your carpet and leave them until they dry up completely. Then vacuum them or just sweep them away. If you are worried about not being able to gather enough used tea bags, you can store them up in your refrigerator until you have enough. All you need to do is put them in a cup of water before placing them in the refrigerator. Restore the shine of your furniture with used tea bags. Dump a couple of used tea bags in warm water. Then apply it to your wood surfaces with a soft rag and your wood will be shining in no time. Apply a used but cool tea bag on rashes and bug bites. The bag will help reduce inflammation and take away the the itch. Applying tea bags on affected area can provide soothing relief from minor rashes and bug bites. If your utensils fail to clean or has a grease of stuck-on lasagna, just grab some old tea bags and see the magic. All you need to do is soak the utensils overnight with hot water and a few brewed teabags and allow the tannins from the tea to break down the grease by morning. You can now wash them clean. Use old tea bags to do a home facial steam treatment. Place your used tea bags into a bowl of hot, steamy water. Lean over the bowl for 5-10 minutes and allow the steam to open your pores which allows the antioxidants in your steam tea tone and hydrate your skin. As a lady you know taking care of your utensils is one of the hardest part of kitchen works. Wipe your old or used tea bag inside your pan after cooking to keep them in the best of conditions. The tannins in the leaves will prevent the oxidising process, leaving your pans sparkling for longer. A clean, good looking pan can make cooking enjoyable. Use cooled, twice-brewed tea as a cleaner. Just dip a soft cloth in the tea and use it to wipe away dirt and grime from your mirror, and then buff dry. This will leave your mirror shinier and sparkling. Press a wet used tea bag to your skin or affected area and this will help stop the bleeding. Tea leaves contain a good amount of nutrients. Adding used tea bags or tea leaves to your bath water can be very beneficial and even enjoyable. It makes your skin softer. Have a spa at home! Green tea works better for this therapy. Black clothings are prone to fade after several washes. To restore its colour back to normal, rebrew old tea bags to get its colour back to normal. After you've washed and rinsed your clothes as usual, soak them in a mixture of tea for 10 minutes or more. Wring out the excess water and hang it to dry. The first try might not turn the colour back fully but doing this occasional will reverse the colour. This trick is safe on black clothings (fully black) only. Do you want a unique flavor in your turkey recipe? Cook an incredibly moist turkey recipe by adding a brewed tea bag and a cup of water to the pan. The tannin in the tea is a natural meat tenderizer and adds a delicious flavor. Be careful you don't bite your fingers later! Who ever wants a guest who doesn't sit to have a chat? Well, I don't! Drive away unwanted house guests with your old tea bags. Mice are every household most annoying visitor. Leave your old tea bags at spots and areas where they regular invade and this will keep them away. Eliminate all dark circles under your eyes by simply placing warm or cold (cold is preferable) tea bag on top of it and same goes for puffy and tired eyes. Stop your gum from bleeding and soothe the pain by just placing a wet tea bag with cool water on your gum and press. You probably do know this trick already. But if you don't, here is it! Store your used tea bag in a cup of water and place it in the fridge so it doesn't go bad. When making a fresh tea in the morning, add your old tea bag to your fresh tea and give it a stronger flavor. If you like strong flavoured tea then you should probably be doing this. If you're found of throwing away your used tea bags, it's time to stop. Rather, re-use them for something creative and helpful. Tea bags should no longer be a one time use product. Rebrew your used tea bag for these amazing things. Don't forget to share if you find this article helpful. Visit again soon as we love having you around. Subscribe below for alerts.